While no one wants a huge machine occupying a space in their RV just to supply electricity, it is still crucial for you to invest in a backup just in case you have a hard time accessing a source of power. In this case, the best RV inverter can come to your rescue. With the best power inverter for RV around, you will be able to take advantage of a device, which is capable of changing direct current (DC) to alternating current (AC). 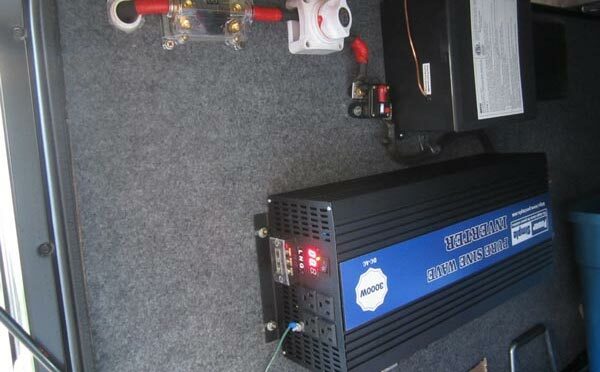 What is good about a reliable power inverter is that it allows you to consume up to a thousand watts. It is also user-friendly, portable, and reliable. It is versatile, too, that you can use it in several applications. You will find it useful in converting 12VDC from a battery into 120 VDC, the standard type of electricity commonly used in households. If you have made a decision to buy one, then the RV inverters that this article will discuss will most likely capture your interest. How Does the RV Power Inverter Work? To work, your chosen RV power inverter will take some power from your vehicle’s battery. The power that it will take is direct current, which the device will then convert to alternating current. It performs such function since all appliances that operate in a household also run using alternating current. You can also expect large electronics to run using alternating current. With that in mind, the RV power inverter can be expected to convert DC power into AC, which will then result in the running of all your appliances without hassle. Also, take note that you cannot use your normal electronics by plugging them directly into your vehicle’s socket. You have to use a converter first, which will convert the 12-volt direct current to alternating current. 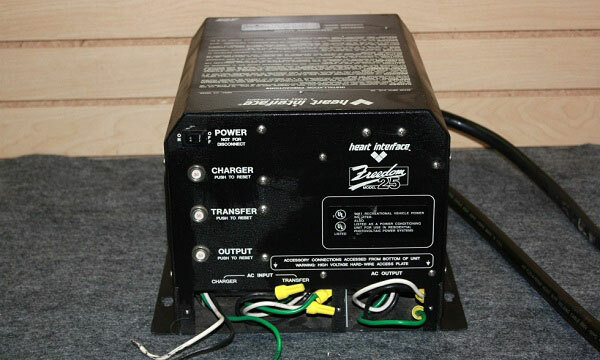 This conversion is one of the things that your RV power inverter can do. You can use it in running different electrical appliances by attaching the inverter to your vehicle then your appliances to the power inverter. Now that you know how RV power inverters work, it is time to familiarize yourself with the different products in this field that are known for their effectiveness and functionality. One of the most commonly used types of inverters used in recreational vehicles is the pure sine wave. It is a good choice as it is perfect for different electronics. Many RV owners prefer this type because most electronic appliances and products that require plugging are compatible with the standard power receive from utilities. It is mainly because pure sine wave provides standard utility electricity, which is the reason why it is compatible with this type of inverter. 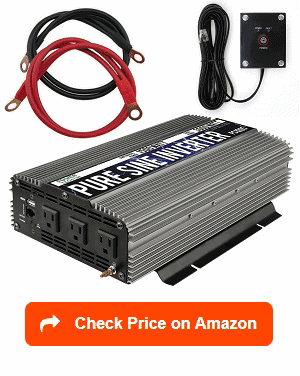 Also, the best pure sine wave RV power inverter also works well with sensitive modern electronics and technological advancements. 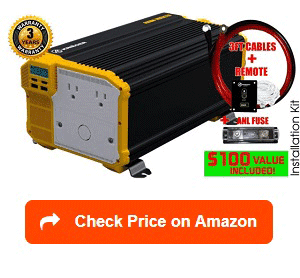 Of course, one of your top choices in this category is the AIMS Power Picoglf30w12v120vr 3000 watt 12v pure sine inverter charger. What is good about this inverter is that it is ideal for heavy-duty use as well as for mobile power. 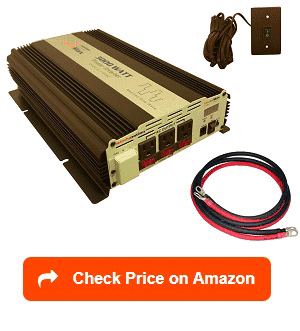 It is a prominent choice with its ability to offer a continuous pure sine power of 3,000 watts. 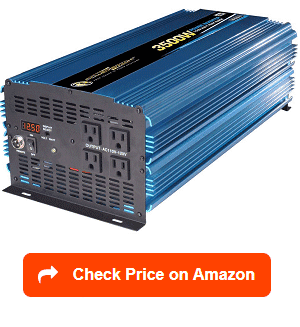 It also delivers a peak power of 9,000 watts. It works well for industrial and marine use as well as for recreational vehicles. It is a powerful inverter equipped with a 100A smart battery charger. Such also boasts of its 7 battery type settings that you can choose from. You can use it in running a number of appliances and tools. The charger included in the package also makes it convenient for you to recharge the battery bank. It is also versatile that you can use it for various applications, like emergency backup power, mobile, off-grid, and renewable solar applications. The 9,000-watt surge capacity of this inverter makes it appropriate for appliances and devices that have high start-up requirements. These include pumps, compressors, and motors. Many also find the built-in auto gen start feature of this inverter handy. It is long-lasting and compatible with almost all types of devices. 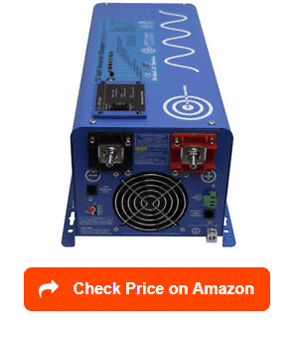 Many also consider this product from Power TechON as the best pure sine wave inverter for RV. It a great solution during emergency power failures. It is also known for its flexibility in the sense that it is compatible with boats, cars, PCs, and camping. Converting DC power to AC is also easy with this inverter. It can deliver a continuous 3,000-watt outlet, as well as a 6,000-watt surge power. In addition, it is known for its stability. This is made possible by the inverter’s low harmonic distortion, which promotes a high level of efficiency when powering various appliances. You will also find it a pleasure to work with as it is compact and portable. Such qualities make it suitable for limited spaces, like in your recreational vehicle. It is also a great inverter with its 5 protection systems. These include protection systems for thermal, overload, under voltage, over voltage, and low voltage. The protection systems are also easy to use since a LED light will just indicate whether there is a problem. It is also equipped with two cooling fans designed to control temperature, thereby preventing the power inverter from overworking. Other nice features are the wired remote, red and black starter cables, and USB port. It is also beneficial for you to pick the Vertamax 3,000-Watt Pure Sine Wave Inverter from WindyNation. This power inverter is a good choice as it is multifunctional and versatile. It is mainly because it can power different kinds of appliances, including air conditioning units, microwaves, video game consoles, PCs, and television. This inverter is also highly recommended for electronic appliances and equipment that are sensitive, especially if they need to use pure sine wave AC power for proper operation. One of its most noticeable features is the LED digital display. It is useful in keeping track of the volts and watts readings in the system. It is also manufactured in a way that it can prevent RV inverter problems with its several protection features. The inverter can offer protection against high temperature, short circuit, over voltage, under voltage, overload, and reverse polarity. You can also see a separate circuit breaker, which is used for each AC receptacle. Such comes in handy just in case a short circuit happens. Furthermore, you can find 3 grounded AC outlets integrated at the back of the inverter. With these outlets, you will have a lot of room for connecting appliances. You can also take advantage of the hardwire terminal. Another 3,000-watt pure sine wave inverter that is suitable for RV use is the GP-SW3000-12 from Go Power. It packs plenty of watts in its single frame considering the fact that it provides up to 3,000 watts of electricity continuously. This makes it possible for you to power up any devices you hook it up to. You will also find its 6,000-watt surge dependable. It comes with a couple of outlets with each one protected by GFCI. You can also find a hardware port next to the outlets. The GP-DC-KIT5 integrated into this device can also prevent issues once you connect the battery source. You can also find a couple of readouts designed to inform you about what the inverter is currently doing, thereby letting you keep track of its present situation. Many also consider it to be the best choice for huge loads. It is useful in powering numerous appliances and electronic equipment, like PCs, stereos, and TVs. In addition, it performs well as a source of backup power during emergencies. It is equipped with all the mounting hardware and tools you need to set it up in a long-haul truck or in your RV. Furthermore, it offers protection from overload, under voltage, and over voltage, making it a really secure inverter. Portability and compactness are also two of the most impressive features in the high quality RV inverter. You need to look for a compact and portable RV inverter especially if your recreational vehicle only has a limited space for this device. That way, you won’t have a hard time fitting it into the available space. With the compact and portable KRIËGER 3000-Watt 12V Power Inverter, you have the chance of gaining power while you are on the go. This device directly connects to a 12-volt DC battery as a means of powering different appliances, equipment, and electronics, like small power tools, air conditioning units, small appliances, handheld power tools, and televisions sets in your RV. It is also equipped with an LCD display. You can use this in keeping track of the input voltage or output wattage as well as the inverter’s current battery level. With this portable power inverter, you will never run out of power even if you are out camping in your RV. 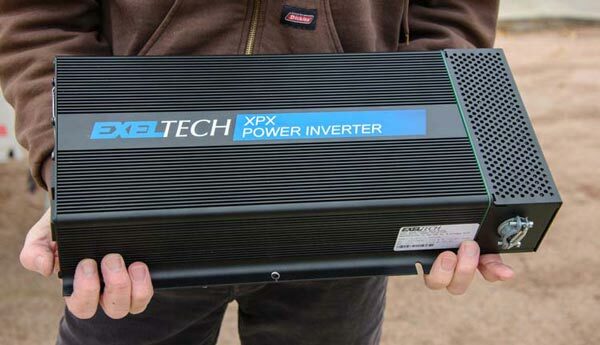 Just like the other power inverters indicated in this article, this one also takes pride in its 3,000-watt continuous capacity. It also boasts of its 6,000-watt peak capacity. It is all-inclusive, too, complete with all the things you need to make it work, like the cables, external switch, fuse, and wired remote control that is really handy. 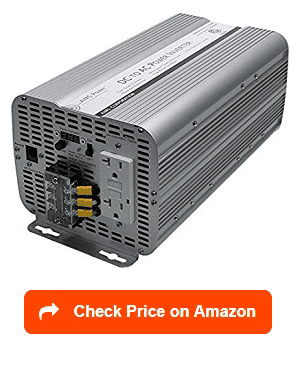 With the many inclusions in the kit, this RV inverter is definitely worth its price. It is a clean and portable power inverter that also operates quietly. Another compact and portable power inverter that is suitable for RV use is the POTEK 3000-Watt Power Inverter. Aside from being portable and compact, it is also beneficial because of its multifunctional power. It is equipped with 4 AC outlets as well as a couple of USB charging ports. Such features make it ideal for various electronic conversions, like those designed for electric motor saw, coffee maker, refrigerator, air compressor, and water dispenser. 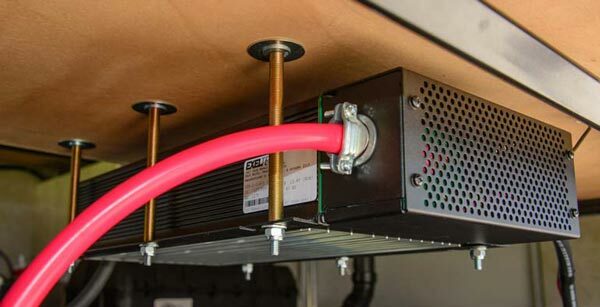 Another nice feature integrated into this power inverter is the smart cooling fans designed to keep the device cool. You can expect the fans to speed up while the load increases. The fans are also made in a way that they will not operate when you turn off the inverter. It is known for being one of the high-powered inverters with its 3,000-watt continuous power and its 6,000-watt peak power. Another reason to invest in this 3,000-watt power inverter is that it offers different systems that offer protection, including those for under- and over-voltage, and excessive temperature. With these protective features, you will never worry about it damaging your batteries or equipment. Reasonably priced, it is safe to say that it is one of those RV inverters that can provide utmost satisfaction to users. Finding the best RV inverter charger will also make you encounter products that can be categorized into the modified sine wave RV inverter category. This type of inverter is useful for simple systems without delicate electronics. It also works for those systems without audio equipment, which might capture a choppy wave, causing the production of a hum. If you have motors with brushes and old tube televisions in your RV, then a modified sine wave can power them up. Note that the modified sine wave inverters are also more affordable than pure sine that is why many prefer this type. If you are seriously looking for a modified sine wave inverter, then the following products are among those that will most likely fit your requirements. 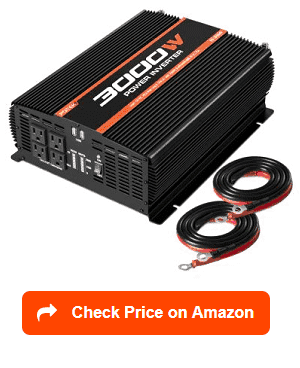 If you are on the lookout for a reliable modified sine wave inverter that can power plenty of equipment and appliances, then this 3,000-watt 12-volt power inverter from WindyNation is a great choice. It can power numerous electronics, including computers, cell phone chargers, air conditioning units, microwaves, video game consoles, and TVs. 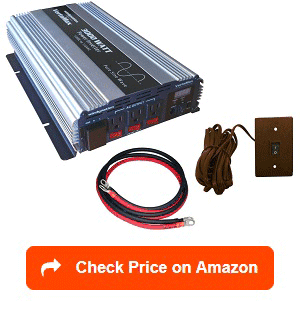 One of the most remarkable features integrated into this power inverter is the LED display. It shows the battery voltage, wattage, and the consumption of AC power. Such will promote ease in monitoring the battery voltage as well as the power usage. One more impressive fact about this RV inverter is that it is available in a sturdy design. The sturdiness and durability of its design make it capable of withstanding different kinds of extreme and harsh environments. It also has the things you need to make this modified inverter work, including the 3-feet battery cable, cable lugs, ANL fuse, fuse holder, and remote on or off switch. It is also equipped with 3 grounded AC outlets as well as a hard-wired terminal block, which you can use in getting permanent AC connections. In addition, it is a protective unit as it comes with thermal shutdown, over-voltage protection, low or high voltage alarm, low voltage shutdown, and short circuit protection. 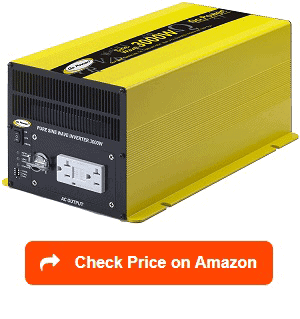 Many legitimate AIMS inverter charger reviews also often include AIMS Power 3,000-watt 12 vDC RV Power Inverter into their list of recommended products. It is not surprising as this product seems to perform its intended function without causing any disappointment to its users. This product can be categorized under the modified sine inverter type. It has plenty of distinguishable features that make it fully functional. One is that it conforms to the standards set in the proper functioning of power inverters. It also boasts of its dual GFCI outlet, which is protective enough. It can supply 3,000-watts of continuous power, which is more than enough for RV users. Furthermore, it boasts of its AC terminal block, which you can connect directly to deliver the entire 3,000 watts power to just one source. Many also find this power inverter lightweight and compact, making it easier to manage. It does not also consume too much space in your limited environment. This device also leaves a good impression with its thermal cooling fan operation. It promotes optimal cooling with the help of its internally fused and protected aluminum case. Furthermore, it works efficiently as a backup power system for RVs, solar systems, cabins, boats, vehicle outfitters, and households. 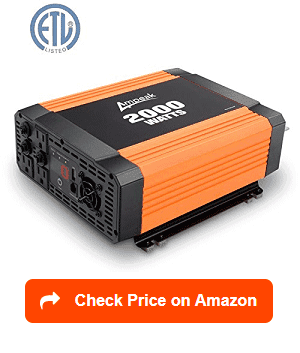 It is also possible for you to find the best option for modified sine RV inverter in the form of this 2,000-watt device offered by Ampeak. It also leaves a positive impression as it is known for being a high-powered inverter with its ability to provide 2,000-watt continuous power output (from DC to AC). 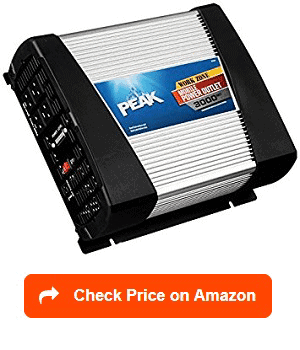 This popular power inverter also takes pride in its surge capacity, which reaches up to 4,000 watts. You will love the fact that it has a wide range of use considering the fact that it features 3 AC outlets as well as a USB port. These features promote ease in using the device anywhere where AC power is necessary. That said, expect it to be compatible with cell phones, electric lights, electric fans, TV, digital cameras, floodlights, freezer, microwaves, electrical tools, and any other electronic devices. It is a versatile product, too, which is proven by its compatibility for home, car, outdoor, and RV use. All it takes is for you to look for a 12-volt battery system where you can connect it to as a means of powering your devices during emergencies, power outages, storms, or hurricanes. It also makes use of its highly advanced protection systems featuring an audible alarm for things like overheating, overload, short circuit, low voltage, and over voltage. You can also take advantage of Xantrex 81201012 Inverter if you are seriously in search of a modified sine wave power inverter for your RV. It is an excellent performer in the industry with its ability to supply 2,000 watts of power in a single output. It also has a 100-amp battery charger while also taking pride in its high surge capability. What is so nice about this device is that it is capable of offering complete protection to all devices connected to it. It can prevent inverter problems, such as under-load, overload, short circuit, low voltage, and over-voltage, among many other issues that require immediate protection. Another positive attribute of this inverter from Xantrex is that it allows users to customize its settings. That said, expect it to be programmable through the Link 1,000 panel or Freedom basic remote. Another impressive capability of this inverter is that it supports temperature compensation along with the equalization phase. Such makes it possible to charge deep cycle batteries in an optimal manner. In addition, it allows power sharing. With that, it is easier for the AC input breaker to reduce the risk of tripping significantly. It also takes pride in its other nice features, like the LED indicators, the transfer switch, and the remote control panel, which is an optional feature. Of course, you would also want to make sure that your chosen power inverter is heavy-duty. It needs to be heavy-duty enough that it can withstand a lot of abuse. Note that your recreational vehicle will be exposed to plenty of elements and different temperatures and weather while you are outdoors. With that in mind, it is really crucial to find a power inverter that can withstand the mentioned elements. It should be solid and sturdy enough that it will continuously provide power regardless of the environment you are in. Also, it should be long-lasting, high-powered, and capable of resisting potential damages. One of the power inverters that many consider as high-powered and heavy-duty is the Power Bright PW3500-12. It is actually a heavy-duty modified sine wave power inverter that can supply 3,500 watts of power. You can directly plug it into 12-volt DC batteries. Once plugged in directly, it will start to perform its function of powering electronics and devices, like laptops, gaming consoles, power tools, refrigerators, televisions, coffee makers, microwaves, and other small appliances and electronics present in your vehicle. It can also supply up to 7,000 watts at its peak. Such is more than enough in supplying power to household electronics and appliances. One of the reasons why many perceive this power inverter as a heavy-duty device is that it is durable. It is because of its highly solid and sturdy anodized aluminum case. Such material also promotes maximum dissipation of heat. One more positive thing about this power inverter is that it has an auto short circuit shutdown. This feature is a big help if you want the inverter to be fully protected from possible damage. One more remarkable feature is the small yet clear and readable LED display. It shows output and input voltage, giving you the chance to monitor it all the time. It features a cooling fan, keeping the inverter cool, as well as a low voltage alarm, which will produce an audible sound in case of thermal, short circuit or overload issues. Another heavy-duty power inverter for RVs also comes in the form of the Peak PKC0AW with 3,000-watt continuous capacity. It also features a 6,000-watt peak power rating. What is good about this power inverter is that it is capable of running a 500 BTU air conditioner through a solar panel system without any problems at all. It is known for working as an effective mobile power outlet. It also functions efficiently as a mobile power tool, giving you the chance to bring it anywhere you wish to go so you will always have a source of power. This functionality makes it appropriate for use if you have a recreational vehicle and you often travel with it. Among the major features of this power inverter are the 3 built-in AC outlets. It also features one USB port. The outlets and USB port promote ease in connecting small and large devices and consume up to 2,000-watt power. You will find it useful not only in mobile power situations but also during power emergencies. What’s even better about this power inverter is that it is constructed while keeping in mind the security and safety of the users and the connected devices. That’s why you can see it providing short circuit protection as a means of safeguarding not only your devices but also the battery and mobile power outlet. It also comes with a remote switch, watt usage indicator, and battery connection cables. The right RV inverter plays a crucial role in your attempt to stay comfortable off the grid or on the road. The ability of the inverter to offer you comfort and convenience is one reason why you have to be cautious at the time you need to select the perfect model for your specific requirements. Power or watts – You will find this factor useful in determining the specific size of RV inverter that you need. Note that an RV inverter has to meet two requirements or needs in terms of power – the first is the surge or peak power and the other one is the usual or typical power. Surge refers to the maximum amount of power supplied by the inverter, often for a short period (up to a max of fifteen minutes). Some onboard appliances, especially those that use electric motor need an inverter with a higher startup surge. The usual or typical power, on the other hand, refers to the power that the inverter needs to supply steadily. Otherwise referred to as the continuous rating, the usual or typical power is often lower than the surge. In selecting the best inverter for your recreational vehicle, it is important to get an idea about average power. This one is significantly lower than surge or typical power. You can use the information regarding average power at the time you need to estimate the required battery capacity. One thing to remember when taking a look on the inverter’s power or watts is that sizing the inverter should be based on the typical continuous load and max peak load. Power Rating – Picking a good RV inverter is also possible if you check its power rating. Remember that inverters are available in various size ratings ranging from 50 to 50,000 watts. However, take note that those units that provide more than 11,000 are not used by potential users that often. One of the most important things you have to know about your chosen inverter is its max surge. You also need to figure out how long it can maintain such surge. An inverter’s surge rating is actually specified at a certain number of watts for several seconds. What this means is that the unit is capable of handling the specified watts for the mentioned period of time. Such rating or capacity differs significantly from one inverter to another so you really have to scrutinize each type and brand to find out which one can meet what you need. Types – You also have to understand the different types of RV inverters that are available today. Be aware of the pros and cons of each one as this can help you spot the perfect fit. You will get to know more about different RV inverter types as you go on reading this article. Energy Efficiency – The energy efficiency of the inverter should also be a deciding factor during the selection process. It should be energy-efficient in the sense that it will not cause a significant increase in your energy consumption. However, this should not also cause the loss of energy and power. The length of time your equipment can operate without AC power – Another crucial factor is how long it often takes for your onboard equipment to operate in case there is no AC power. You can choose small, in-vehicle RV inverters when planning to run equipment at an indefinite period while ensuring that the battery power is available and the RV’s engine is running. In case you need a good supply of power for an extended period, then it is necessary to invest in large inverters. Input and output voltage – Determine the unit’s input and output voltage, too, as it helps you figure out if it is indeed a good fit for your RV. You need to choose an RV inverter, which is compatible with the battery’s voltage that supplies power to it (input voltage or DC). If you make use of a 12V battery, for instance, then it would be ideal to pick a 12V DC RV inverter. One more thing to take note of is the output voltage or AC. Note that electronic devices in Canada, Mexico, US, and some parts of Latin America utilize 120V AC power. Other devices available in other parts utilize 220V to 250V AC power. 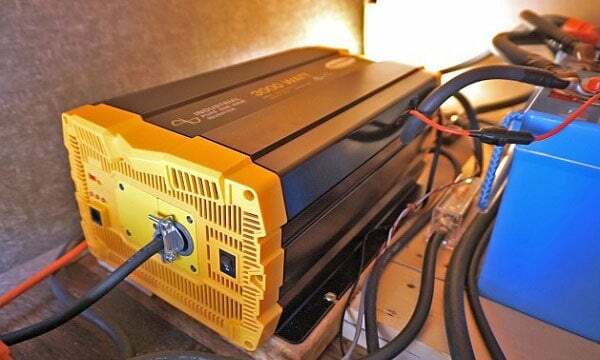 An inverter designed for your recreational vehicle refers to a device with the main purpose of converting low-voltage direct current (DC) power to the standard alternating current (AC) power. Once installed, you will realize how useful this device is in operating electrical equipment and other onboard appliances with the aid of the power that renewable energy sources, like wind turbines or solar panels, or the battery of your boat, car, or truck can produce. In other words, the inverter serves as a reliable source of power for the equipment and appliances in your boat, work truck, car, and RV. You can also use it in protecting your belongings in case of a power outage. It is because it can supply an emergency backup power to certain equipment, like freezers, refrigerators, etc. Sine Wave – One popular type of RV inverter is the sine wave. This type refers to what you usually receive from generators and local utility companies. It is mainly because you can generate it by rotating air conditioning machinery. Also, sine waves are known to be naturally produced through such rotation. One advantage of this type of RV inverter is that all appliances and equipment that are currently on sale in the market are suitable for it. With that in mind, you have a guarantee that the equipment and appliances in your RV will operate based on their full specifications. 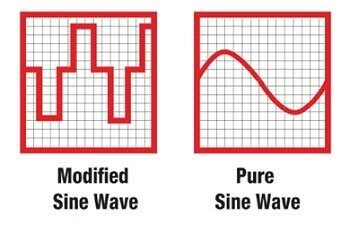 Also, take note that certain appliances, like microwave ovens and motors, are only capable of producing their full output when you use sine wave power. Other appliances, like light dimmers, bread makers, and battery chargers also need this type to operate. The only problem with this type of inverter is that it is quite expensive. In fact, its price is around two to three times higher than the other types but it is actually worth it. Modified Sine Wave – This type boasts of a waveform. What is good about this inverter is that it works fine with the majority of equipment. However, you should remember that it also causes reduced power or efficiency in the mentioned equipment. Also, motors, like the ones used in refrigerators, fans, and pumps, will consume more power from the modified sine wave inverter because of its lower efficiency. In most cases, they are capable of consuming around twenty percent more power. In case there are fluorescent lights in your vehicle, then you can’t expect them to operate as brightly as when you are using other types of inverters. There are also instances when they will produce some humming sounds or buzz. The modified sine wave inverter also tends to produce more noise than the pure sine wave. If you do not care too much about the mentioned issues, though, this inverter will still work in your favor. You will also be most likely pleased to know that it is cheaper than the pure sine wave. Square Wave – This type is the cheapest among the most popular forms of inverters. It is capable of operating simple things without issues. These include tools that feature universal motors. However, its capability is limited to that. That is why you can rarely see square wave inverters at present. Your RV inverter functions by taking 12V DC power for the batteries of your RV and changing it electronically into 120V AC. Keep in mind that your RV batteries are designed in such a way that they can supply power in DC (direct current) running at a low voltage. If you are an RV enthusiast for quite some time now, then you have most likely experienced that scenario wherein you are in need of an inverter. It could be during that time when you decided to go dry camping without any access to an electricity. Highly Efficient – Aside from inverters, you can also make use of gas-powered inverters as a means of supplying you with the power needed to operate your onboard devices. However, these generators can’t provide the same level of efficiency provided by reputable power companies to your home. If you decide to invest in a pure sine wave power inverter then rest assured that it is capable of supplying you with such highly efficient power. The majority of devices and appliances can operate using pure sine wave power. While you can also use the modified sine wave type, it tends to run hotter than what is normal. It also tends to have a lower efficiency than the pure sine wave. This means that if you wish to enjoy the benefits provided by an inverter as far as energy efficiency is concerned then it would be best to go for the pure sine wave type. Does not require fuel/gasoline – The major function of a power inverter is to convert battery power, which means that it does not require you to use gasoline. This means less hassle on your part since you no longer need to store enough supply of gasoline just so you can get power all the time. Remember that you can only store gasoline for approximately one month. With that in mind, using generators instead of inverters requires you to store fresh gasoline all the time, so you will not end up having to run to gas stations in case of power outages. If you do not want to deal with the hassle of storing gasoline, then investing in an RV inverter is the best decision you can make. Does not produce noise – It is no longer a secret that generators produce a lot of noise, especially if you go for the cheapest models. RV inverters are popular for their ability to operate without noise. They function silently. This is beneficial, especially if you need to use power supply in a campsite. You do not want to use a noisy generator, which can be a nuisance to those around you, do you? What size of RV inverter do I need? The perfect size of an inverter for your needs will depend on how you plan to use the unit. You do not want to end up buying a larger inverter than what you need or a unit, which is too small that it can’t accommodate your needs. In determining the ideal RV inverter size for your needs, you have to remember that these units are rated in watts. You can also find them in various sizes and ranges of power. They can run from 75 to 3,000 watts. If you do most of your camping at the campgrounds where there is an abundant supply of electricity, then an inverter may be unnecessary. However, you might find your camping experience more enjoyable by having an inverter and batteries that can meet your 120V requirements. In selecting the right size of the inverter, it is also a must to assess its output capacity. The best choice is that which can operate on the loads placed into it. In this case, be aware that there are two capacity ratings available for the inverter – the surge capacity and the continuous output rating. Aside from that, be aware that you can now find inverters in small and portable sizes. These are the ones that you can directly plug into a 12V outlet or cigarette lighter, supplying power or electricity to the whole electrical system of your vehicle. What is good about these units is that you can permanently install them in your vehicle. You can also go for the inverter or chargers found in the majority of recreational vehicles today. They are not only inverters but also serve as transfer switch and battery charger in one. The units serve as battery chargers each time you plug them into a source of electricity or when you are using a generator. What’s good about these inverters is that they are also capable of storing DC battery power without any available generator power or source of electricity. They can automatically transfer the power into the battery charger. How to install an RV inverter? Installing an RV inverter is something that you can do alone. If you use a small inverter – one which operates at approximately 75 watts, then you can just conveniently plug it into an outlet for a cigarette lighter. Inverters that are larger than that, however, will need to be directly wired to your batteries. In case you need to install the unit using the latter method then you have to do it really close to the batteries to minimize the risk of losing voltage. It would be best to check the manual, too, as it will give you a suggestion regarding the ideal wire size. Go for the size that is recommended in the manual or one that is larger. 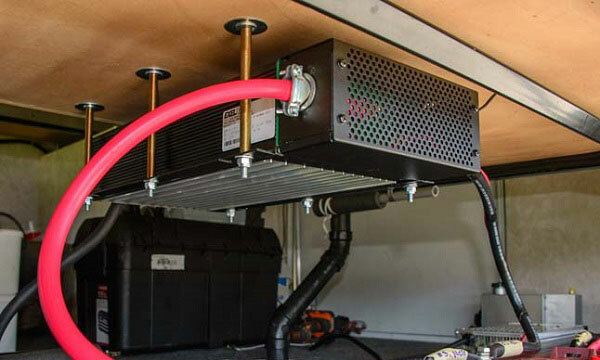 As for the actual installation, the most efficient but expensive way to do it is by connecting the unit directly into the AC distribution box of your RV. You can connect it via the transfer switch. Remember that the kind of switch will differ depending on the inverter’s power and whether or not you also have an RV generator. The transfer switch will choose shore power provided it is available. In the absence of the shore power, it will choose the power of the inverter. In case you prefer to choose this route in terms of installation, powering up your converter from the RV inverter should be prevented. One way to avoid that is to utilize a split distribution panel. Another method of installing the RV inverter is by using an extension cord. All you have to do is to run it from the RV inverter to any device you intend to power. The only downside to this method is that it is a bit troublesome and tiring to plug and unplug various devices to the extension. How to use an RV inverter? RV inverters come in different sizes and are measured by watts. The power you need to use will be fully dependent on the specific equipment you choose and plan to use. The majority of RV inverters, specifically those that run lower than 300 watts, can be plugged to your vehicle’s battery with the aid of a DC port found on that dash. If available, you can use the cables provided by your chosen model by connecting them together with the battery directly. What is good about the inverter is that it comes with at least one basic socket that you can use in charging portable devices, like DVD or video player, laptop, and TV. An RV inverter, which transfers DC current into AC is ideal if you wish to go on picnics specifically on areas without electricity. To use the inverter wisely, it is also advisable to run it with a fully charged battery. The battery should be in excellent condition, too, as a weak one might drain fast. If that happens then you will most likely be in passive scenarios. This is the main reason why you have to examine the battery prior to operating the inverter. Another thing to keep in mind when using the power inverter is to ensure that the wires in your car work compatibly with the current. Check their compatibility prior to plugging the unit into a lighter. Moreover, there should be enough and suitable ventilation for the RV inverter. Note that regardless of the size of the inverter, it will still produce heat. With that in mind, find out if there are available fans within an inverter, which operates at least a hundred watts. Ensure to use it in an area that has good ventilation, too. When should you turn your RV inverter on/off? Using your RV inverter correctly also requires you to understand the perfect time to turn your unit on or off. In determining when you should turn on your RV inverter, it would be best to answer the question of whether or not your vehicle comes with a charger or an inverter. If it features such then each time there is an available source of AC power, the charger will be capable of charging the batteries completely and maintaining them. Such is beneficial because the batteries that are considered as the source of power needed by an inverter have to stay at a full charge or close to it. With that, the batteries will be capable of supplying a reasonably long power in the absence of other AC power source. Another thing you have to keep in mind when determining the right time to turn your RV inverter on/off is that the power needed in running the unit is usually around 8 to 10 percent higher than a load of power required in running your appliances. This is mainly because most modern and high-quality inverters are now highly efficient. In fact, you can find inverters that are around 90 to 92 percent efficient. Also, take note that your inverter will most likely consume power from the batteries in case it is unused but stays turned on. The power it draws differs from .02 amps to 2 amps. The figure will fully depend on your actual inverter as well as how its standby systems are designed. In case you keep your unit turned on without connecting any load then it is possible for your batteries to draw around 1 amp every hour on average – a total of around 24 amps daily. To prevent your unit from drawing too much power, it would be best to turn it off if you do not need it to prevent the battery from draining to zero. The good news is that this is a convenient process as some inverters today have optional or standard remote controls to turn them on or off. What happens when an RV inverter goes bad? An RV inverter, which goes bad, will cease to function properly. This leads to power interruptions, the failure or the breakdown of the unit, and huge financial losses, especially if it starts drawing too much power. To deal with the issues that might result from a malfunctioning RV inverter, you have to be more aware of its possible causes. One possible cause of a malfunctioning RV inverter is its improper installation. Other possible causes include failure to stick to the recommendations and advice indicated in the manual and choosing the wrong type of cable, in line fuses, or gauges. You have to figure out the exact cause, so you will know exactly how to prevent your unit from malfunctioning. When maintaining the excellent condition of your RV inverter, it is advisable to constantly check it for the presence of the following issues. It is because these issues are indications that your unit is on the verge of partially or fully malfunctioning. Wear on the capacitor – One reason why your RV inverter malfunctions is its capacitor’s electromechanical wear. Remember that your inverter fully depends on its capacitors as a means of constantly supplying an excellent power output regardless of the current’s level. The problem is that these capacitors come with a limited lifespan. They also tend to age quicker when compared to dry parts. Such might cause the failure of the inverter’s main functioning. Also, these capacitors are known to be temperature-sensitive so avoid going beyond or lower than the required operating temperature. You can prevent capacitor wear by scheduling regular maintenance. Replacing them can also prevent the majority of problems triggered by possible wear and tear. Overuse – Overusing your inverter might also cause problems to it in the long run. This is the main reason why you should avoid utilizing it over its operating limit. Note that constantly overusing it might cause its bridge failure. Avoid using the inverter at a higher than the operating limit’s rating as doing otherwise might also lead to its failure and lower lifespan. To prevent issues associated with overuse, make it a point to check whether you are running/operating the inverters correctly. Ultrasonic vibrations – Another issue to avoid is ultrasonic vibration as it can put a lot of mechanical stress into the unit. This issue might trigger friction that can increase the unwanted heat that your unit generates, causing damages to its components. To avoid this, do not overlook regular maintenance. Remember that electrical connections have the tendency of corroding or loosening. Do not neglect any sign that it is experiencing wear and tear, so you won’t have to deal with ultrasonic vibrations. Choosing the best RV inverter is the key to having a continuous supply of power in your recreational vehicle regardless of where you decide to go. However, make it a point to do a comprehensive comparison of the different RV inverters. That way, you can choose one, which is not only fully functional but is also easy to use. Also, note that you will need a portable and compact RV inverter, one that you can easily fit in your vehicle. It should also be reliable that you can constantly put your mind at ease, knowing that there is a tool that you can use to ensure that you will never run out of power. We would like to thank you for reading this article. Find out more about how to choose the best RV solar panels and best RV generators with our reviews and ratings. Furthermore, please take a look at the best RV surge protectors, best RV converters and best RV batteries to buy the right one for your RV power and electrical supplies. I read your post very helpful to me because I am an Engineer. Oh, Hope you find it works, thanks anw. I just need one of this inverter for my RV. Thank you for this great guide! Usually I don’t learn article on blogs, but I wish to say that this write-up very pressured me to try and do so! Your writing style has been surprised me. Thank you, very great article. Cool blog. Thank you for sharing.